LA, 1965, a beautiful female movie star walks into a seedy detective’s office and makes him an offer he can’t refuse. Only the detective is a robot. One of the greatest exponents of pulp genre noir detective fiction, Raymond Chandler, reputedly turned his nose up at one of the other popular pulp genres of the time – science fiction. The two trod very different paths – one on the seedy side of reality with hard drinking, smoking, wise talking gumshoes and the other full of chrome flying saucers, ray guns and bug eyed aliens. But even at the time there was a little crossover, Isaac Asimov’s Caves of Steel and its sequels featured a robot detective, although one constrained from violence by Asimov’s Laws of Robotics. 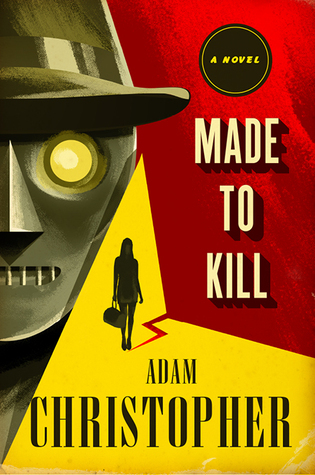 Made to Kill, a perfect mash-up of noir detective fiction and raygun gothic scifi, came out of a question to New Zealand author Adam Christopher about a novel he would like to find. Knowing of Chandler’s dislike of science-fiction, he imagined a science fiction book written by Chandler. But not content with imagining this chimera, he went out and wrote it, first as the short story “Brisk Money” (which can be found here) and now as a full length novel, and first of a trilogy. Raymond Electromatic, the last robot left in the world works for a detective agency run by his partner, a snarky but super efficient female supercomputer called Ada. Ada, programmed by their creator to maximise success, has discovered that it is much more logical and profitable for Raymond to contract as a hitman rather than as a detective. And since Raymond is practically unkillable and has to have his memory wiped every day, he is perfect for the job. When movie star Eva McLuckie offers them a bag of gold to find her partner Charles and kill him, Raymond and Ada take the case, knowing that Eva herself will also not live to reveal their secret. From there on, Made to Kill is classic noir detective fiction with a scifi twist. The case takes Raymond across LA, from Grauman’s Chinese Theatre to exclusive nightclubs and up to the revamped Hollywood sign, and turns out to be much bigger and more deadly than first appeared. But being scifi, there is also a fair amount of mind control, laser guns, evil scientists and a techno-macguffin to drive the plot. Putting the genre mash element aside, Made to Kill is overall just a lot of fun. From the retro-futuristic cover onwards, Christopher manages to be reverential and tongue-in-cheek at the same time. Raymond, for all of his lack of emotion, is a sympathetic character and a classic noir detective. Christopher’s plotting and pacing is spot on and the conspiracy lying behind the initial investigation is as wide reaching as it is ridiculous.